Italians love a wedding, they tend to keep away from the hot summer months when those of us from colder climates dream of those long, warm Italian summer days. 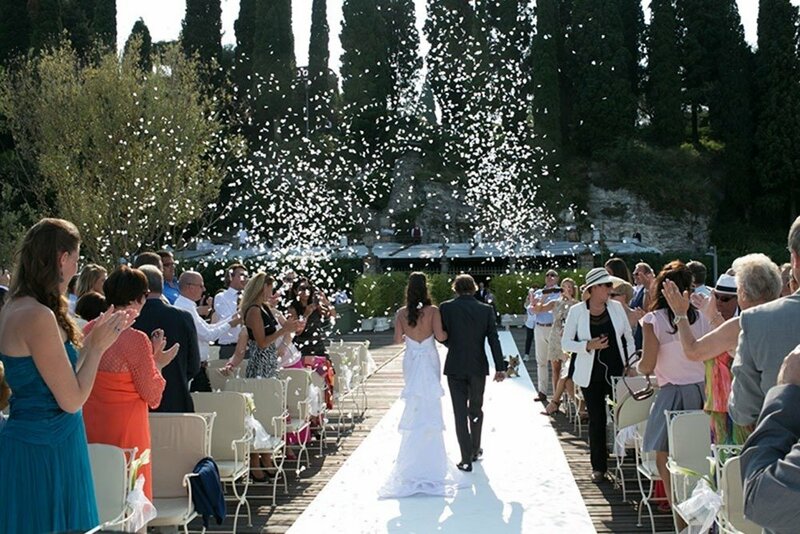 Use some of these age old traditions and fun touches to make your Lake Garda & Iseo Wedding authentically Italian. Like in the Uk and in many other places, it’s thought to be bad luck for the bride and groom to see each other before this wedding, hold off with those first look photos if you want to stick to Italian traditions at your wedding! The bride should make sure that for a long, prosperous future she doesn’t forget to wear those essential items that are old, new, borrowed and blue, think old necklace, new dress, borrowed earrings & who knows shocking blue shoes! That little garter ‘ giaretteiera’ plays a big part in Italian wedding tradition, traditonally the groom would remove the garter during the evening and toss it into the crowds, something to shock those grandparents or great aunts! Forget those real or paper petals, rice is the Italian wedding confetti of choice. Throwing as the Bride & Groom make their grand exit after the ceremony is both fun and traditional, not to mention nutritious for the birds who peck up those grains once you’ve headed to the reception. Long grain, arborio, basmati or Thai red rice, the choice is yours! Italians don’t traditionally go for tiered, eloborate cakes, keeping it simple but tasty. Cakes are usually round with lots of fresh fruits covering the entertop, stunning and fresh after al those courses. An aperitivo is incredibly Italian and personally my favourite part of the evening ( greedy me !). 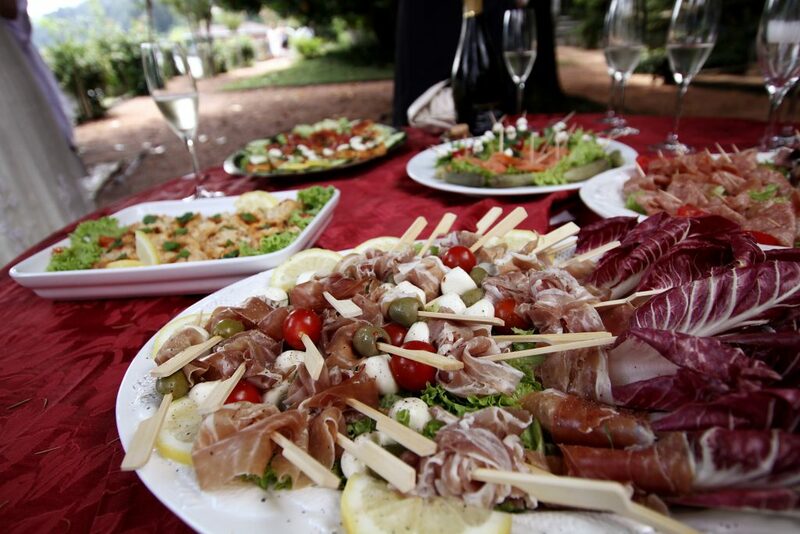 After the intensity of the ceremony, an apertivo is a huge array of food such as Italian meats and salamis, cheeses, bruchetta, olives, breads, the list goes on… Not to mention a fine glass of prosecco or an ice cold aperol spritz. 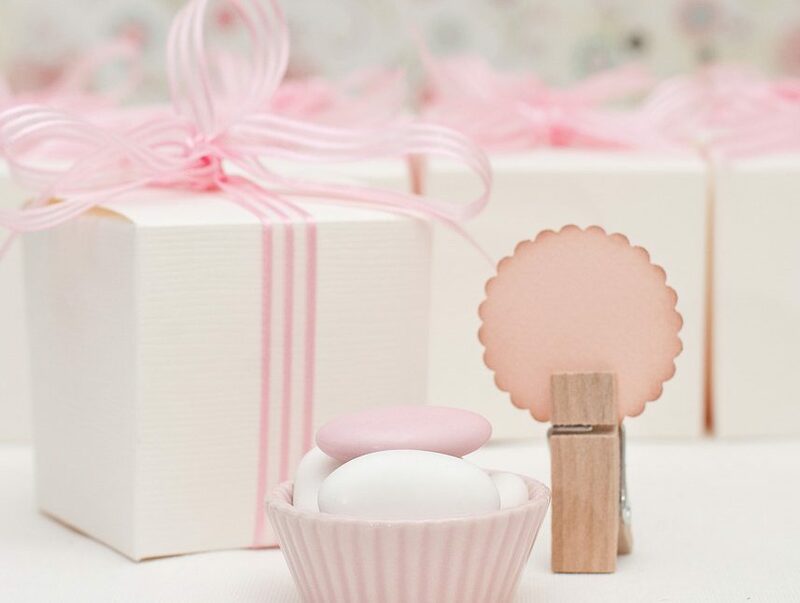 Italians give sugared almonds, rather confusingly called ‘confetti’, as wedding favours to their guests, nowadays you can find a wide variety of flavours or different nuts.. They are often given in a tied decorative bag of five and are generally white to celebrate the white wedding. however more recently many couples have been swayed towards having a confetti table where your guests can pick and choose. The bride, groom, bridesmaids, ushers or whomever you want to take revenge on, sits on a chair which is then lifted and spun around, perhaps better to do earlier on in the evening! These funny pranks are a big part of an Italian wedding both thought up by the bride and the groom and their friends and family. Newly weds may hire rude or incompetent waiters and watch with glee as it slowly dawns on their unexpecting guests. Guests are often known to sneak back to the couples home to hide a fish in the bath tub or sprinkle itching power between their sheets!